Coca-Cola and Singapore’s Health Promotion Board: Tea, anyone? “’Then you should say what you mean,’ the March Hare went on. It never fails to amaze me that truths are often found in the simplest expressions. When I first read Singapore’s Health Promotion Board’s (HPB) “FAQs on Sexuality” via a friend’s Facebook post on 3 February, I was impressed with the matter-of-fact tone of the publication. But, that optimism and pride very soon turned into disappointment. The online media provided a good overview of the matter, including highlights of reactions from readers, which ranged from outrage at the apparent support of homosexuality to kudos for the unbiased delivery of necessary health information. I’ve provided several links at the end of this post. Some time in the week of 27 January: HPB posts FAQs on Sexuality on its website (Home-Health Topics-Sexual Health). 3 Feb (or thereabouts): HPB amends its FAQs on Sexuality by removing links to LGBT websites, namely Oogachaga, SAFE Singapore and Action for AIDS. 4 Feb: A petition to reinstate the original FAQs is started. The FAQs on Sexuality brings to the fore issues of sexual health. That it seemed to give “undue” air-time to homosexuality is a matter of perspective and, to me, was the thing that hit a sore nerve. In the private sector world, Coca-Cola’s Superbowl advertisement – the one that had Americans of diverse cultures, ethnicities and lifestyles singing “America The Beautiful” in a variety of languages – sparked an online furore with detractors of the commercial vowing to drink Pepsi henceforth, amongst other threats and nasty remarks. Both these instances, even if they don’t seem to be, are similar from a public relations perspective. They bring to light the shared concern of discrimination, and they illustrate the significance of standing by company values. And one need only go to Coke’s corporate page to read what the company says are its values. “…thank you for sharing your feedback on our website. We will take into consideration relevant inputs and feedback in our continual review of our public education resources. We would like to reiterate that the family remains the basic building block of our society. This means encouraging heterosexual married couples to have healthy relationships and to build stable nuclear and extended family units.” This was posted on 4 February at 9.49pm. First, I’m quite sure that an organisation such as HPB would have done its homework before publishing the FAQs on Sexuality; ranging from academic research to gathering field information to consulting with experts to measuring the public relations quotient of the whole exercise. So, what are HPB’s values? To be a proponent of healthy living for all Singapore residents, for all the nation? Or only some of the nation? And why hasn’t it come forth to stand by its decision to publish the FAQs on Sexuality in its original entirety, especially in view of the academic research, and gathering of field information, and consulting with experts, and measuring of the public relations quotient that, we would be forgiven for assuming, happened prior to its publication? Unless and until HPB actually makes a statement on this, we can only speculate. 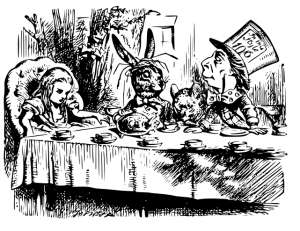 Going back to what Alice was chided for at the tea party, by a person in a funky hat and a talking rabbit, until such time, it would be difficult for anyone to understand what anyone means when they say what they don’t mean, or don’t mean what they say. ← Onward to 2014 in Fine Fettle! Q2 2015 already?! Well, this is how we spent our Q1!